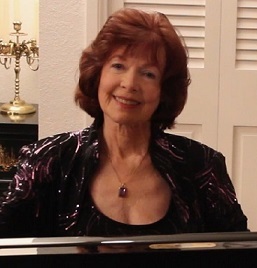 Dr. Billie Raye Erlings is Professor Emerita of Music from the University of Arizona where she served on the Piano Faculty. She was one of the first women in the nation to hold the Doctor of Musical Arts degree, awarded by the University of Oregon in 1970. With Bachelor and Master of Music degrees from her home state alma mater, Louisiana State University, her other faculty positions were at the University of Kansas, California State at Los Angeles, Southern Oregon University (SOC), the University of Oregon and Stephen F. Austin State University in Texas. Billie Raye also had private studios in Lawrence, Kansas, Burbank and Toluca Lake, California, and Tucson, Arizona. Recognized internationally for research and leadership in piano education, Dr. Erlings was a pioneer of televised piano instruction, basic music skills enhancement through technology, and aesthetic valuing. 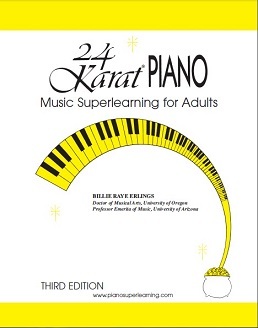 Her publications for piano studies introduced many innovations that led to her “superlearning” approach and to her current book 24 Karat ® Piano: Music Superlearning for Adults, 3d ed. which can be purchased locally in Ashland by special order from Bloomsbury Book Store or Cripple Creek Music Co.
After retirement from their university careers, Billie Raye and husband Kurt moved their company, 24 Karat® Music Discovery, LLC and their piano and video studios to Ashland. Billie Raye offers private and small group lessons to students of all ages. She is a specialist for beginners, early-level students and restarters wanting a new approach. She coaches more advanced students, offers both traditional and distance-learning lessons and conducts lecture-demonstrations and workshops for teachers. The company’s new website drerlingsnotes.org offers the book, a new video companion to the book, and 24 Karat® Club Membership to music superlearning enthusiasts. Free consultations; selected scholarship opportunities. When contacting by email or phone, be sure to reference “Inquiry for Lessons” or your special interest. THANK YOU!